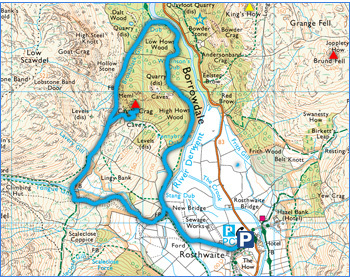 The weather is due to be quite appalling today, with ferocious winds high up so todays walk stayed low and followed a route up to Castle Crag in Borrowdale. Castle Crag infront of Low Scawdel. Over to the right you can see Kings How and Grange Fell. Starting the ascent to Tongue Gill and the view is opening up behind. Eagle Crag, and to its left is Greenup Gill. It was shortly after here the first shower of the day fell. The Col between Castle Crag and Low Scawdel. 'The Elephant Graveyard' as some people know it by. These grave like structures in the quarry near the summit. The summit of Castle Crag. A spectacular view north to Derwent Water. Part of the summit quarry. Kings How across this narrow section of Borrowdale. Beautiful Borrowdale... Even in this strong wind and rain! A view over towards Glaramara behind High Doat. Old mine levels around Castle Crag. It was only a few moments after this that the rain really started coming down... It was rather wet to say the least when we got back to the car!